The flu is hitting West Michigan early this year and our house couldn’t quite avoid it. Luckily, I’ve managed to fend it off so far, but both J and L came down with it right after Christmas. After a pretty rough night, we decided to take a trip to the Westside Family Medical Center to see what was going on. I wasn’t showing any symptoms, so it was just J and L who got checked out. J actually had influenza and L was starting to show some signs, so they were both prescribed Tamiflu to head it off. L was pretty exhausted after a three hour trip to the doctor and fell asleep as soon as we got her back in to her car seat. J was hungry, but not really hungry for food. 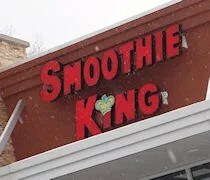 She wanted a smoothie and thought of Smoothie King on Drake Road. The national chain has over 600 stores nationwide after getting its start as a vitamin shop in Louisiana. The only Kalamazoo location is on Drake Road just south of Main Street. It’s in the little shopping center where Colonial Kitchen is. The first time J stopped, right after leaving the doctor’s office, J went in by herself. I stayed in the car with the sleeping baby. The next day, J asked if I’d go back and get her another smoothie. I’m really not a big fan of getting things like this for J because I always screw them up. I don’t drink smoothies, so when they start asking me questions beyond what J told me to get, I have no idea how to answer. Still, my wife was under the weather and I wanted to help her out, so I went to get her another drink. The small shop is mostly one long, open kitchen and a cash register. The layout seems kind of an overkill to me. 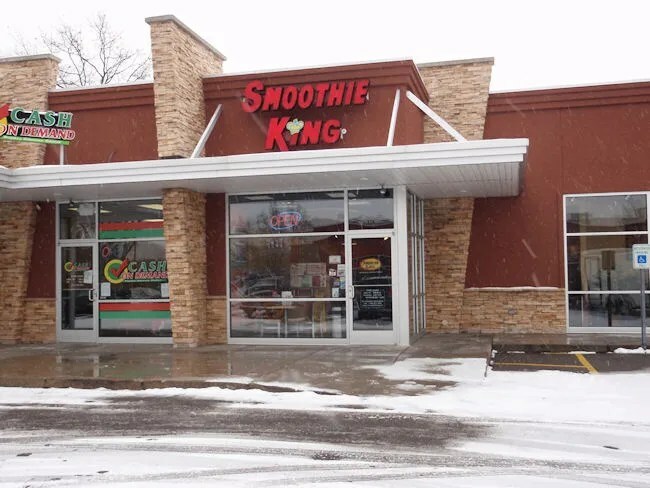 I can’t imagine there’s ever a huge rush for smoothies in that location. Right up front is an order counter with a large menu board hanging on the wall. The lone employee came out of a back room while I was looking it over and asked what I wanted. I ordered a large Immune Builder. 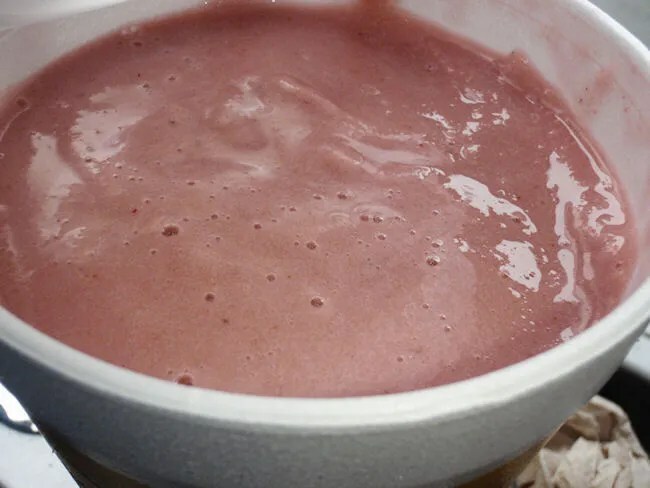 This smoothie is made with bananas, strawberries, an Herbal Nutrient Blend, Turbinado and Soy Protein. I pulled out my credit card to pay and was told to take the ticket down to the cash register at the other end of the store. That’s the part that seems kind of ridiculous to me. She asked for my name like we were at Starbucks or something….and I was the only one in the store. Anyway, I walked past the area where they blend the shakes down to the cash register and waited for my smoothie to be ready. The bill for the large drink was just under nine bucks. For two days, these smoothies were about all J ate and she seemed to really like them. They were the perfect sustenance while she was feeling under the weather.